No big change this week from the recent story, although one long leading indicator did flip negative this week, and another edged a little more towards neutral. 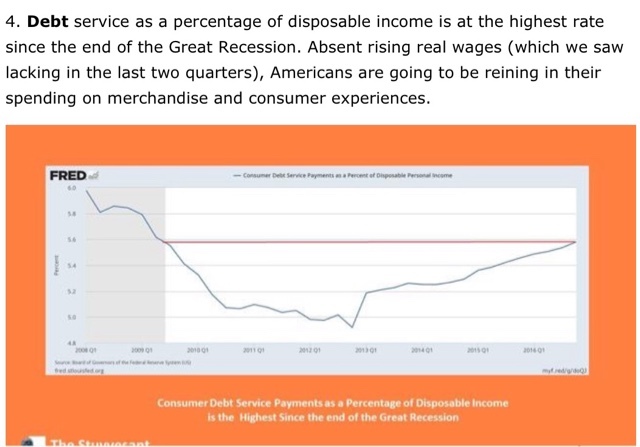 When I see an article trumpeting an oncoming recession, I will usually take at least a quick look to see if maybe there is an indicator that I've been missing or discounting. Or if it is just the usual cherry-picking of data never relied upon before, and probably not to be relied upon again once it reverses. So this morning I read that there was a "Gathering Storm of Recession Indicators." I immediately focused on the limited time shown by the graph: the last 8 years, with a nice red line showing how the value now is the value then. Both are pretty much going sideways as of the last report. Nothing exciting happening there. 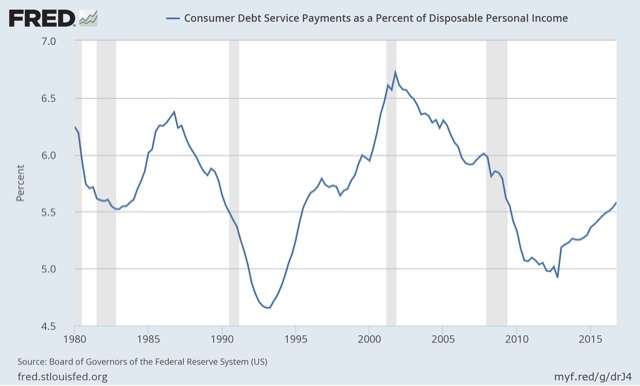 Consumer debt service as a percentage of disposable personal income has been *declining* in advance of 3 of the 4 recessions since the reports were initiated. In the 4th case, the rising debt level was much higher than it is now. Hey, pretty red line though! This is the second part of a post about "hard data" and consumer spending. Yesterday I noted that self-reported consumer spending, as measured by Gallup, has been running 10% or better YoY since the beginning of February, consistent with Amazon.com's earnings growth, but in contrast to a small slump in retail sales as reported for the last two months. Since this measures spending, there is clearly a divergence between this measure and Gallup. In the past, consumers have not caved in without saving less first. It could always be different this time, but my suspicion is that we will see a much more substantial decline in the savings rate before we see a real, sustained downturn in spending. Several days ago, both John Hinderaker and Jazz Shaw promoted a story from the Washington Examiner, which in turn covered a new Harvard Business Report study on the effect of San Francisco's $15 minimum wage increase on the restaurant industry. Yesterday, I observed that the report contained a key passage that essentially countered Mr. Shaw's and Mr. Hinderaker's assertion that "basic economics says the increase in the minimum wage is bad." Today, I want to look at the actual results of the report, because a nuanced reading shows that neither Mr. Shaw nor Mr. Hinderaker's points are validated. This paper presents several new findings. First, we provide suggestive evidence that higher minimum wage increases overall exit rates among restaurants, where a $1 increase in the minimum wage leads to approximately a 4 to 10 percent increase in the likelihood of exit, although statistical significance falls with the inclusion of time-varying county-level characteristics and city-specific time trends. This is qualitatively consistent but smaller than what Aaronson et al. (forthcoming) find; they show that a 10 percent raise in the minimum wage increases firm exit by approximately 24 percent from a base of 5.7 percent. Differences in sample and specifications may account for the differences between our study and theirs. Next, we examine heterogeneous impacts of the minimum wage on restaurant exit by restaurant quality. The textbook competitive labor market model assumes identical workers and firms who therefore are equally likely to share in the minimum-wage generated employment and profit losses. However, models that depart from the standard competitive model to allow for heterogeneous workers and firms suggest that a minimum wage increase would cause the lowest productivity firms to exit the market (Albrecht & Axell, 1984; Eckstein & Wolpin, 1990; Flinn, 2006). We show that there is, in fact, considerable and predictable heterogeneity in the effects of the minimum wage, and that the impact on exit is concentrated among lower quality restaurants, which are already closer to the margin of exit. This suggests that the ability of firms to adjust to minimum wage changes could differ depending on firm quality. Finally, we provide evidence that higher minimum wages deter entry, and hastens the time to exit among poorly rated restaurants. The report's conclusion is hardly breathtaking. According to the report, somewhere between 4 and 10 restaurants per hundred will close as a result of the increase in the minimum wage. And, that number may fall when other variables are added to the mix. In addition, so far only the lower rated restaurants are impacted. And considering the minimum wage is just going into effect, it's possible the techniques used by higher rated restaurants to limit the impact will be passed down to the lower rate restaurants -- which is a standard development in the market economy. In fact, the findings are consistent with the literature. As this report conceded: even studies that identify negative impacts find fairly modest effects overall, suggesting that firms adjust to higher labor costs in other ways. Most economists would call a 4-10% closure rate (which has the potential to be lower when other factors are considered) of marginally efficient restaurants modest. And a final point: the authors make no mention of San Francisco's restaurant bubble. That means that we could simply be seeing correlation, no causation. First: Jazz Shaw doesn't read for comprehension. Second: Jazz Shaw shouldn't be allowed to write about economics. Third: Jazz Shaw will continue to do so, largely because he thinks he's an expert. And so, we will continue to point out just how wrong he is. This was originally one post but I think it works better divided into two parts. One of the issues I keep reading about recently is the (alleged) divergence between "soft" and "hard" data. 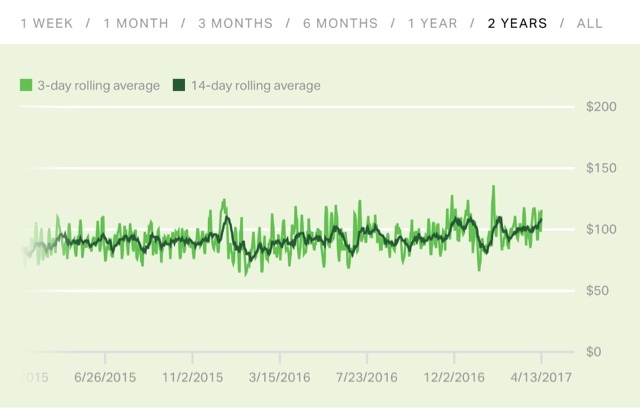 For example, consumer sentiment as measured by the University of Michigan (and the Conference Board, and Gallup) has been making new highs since the Presidential election last November (according to Gallup, mainly fueled by a massive gain in optimism among Republicans). while "hard data," chiefly industrial production but also including consumer spending, has failed to follow suit. So a Doomer who was all over the decline in industrial production for the last two months should be touting its advance in March. If the Doomer backs out utilities this month, take a look to see if they did the same thing last month -- almost certainly not. Pay attention to that $100 line. Except for Christmas seaon 2015, that line wasn't breached at all in the 14 day average until December 2016. And spending has remained above that $100 line all during February, March, and April so far. Most often for the last 10 weeks, this measure has been up over 10% YoY. Now, before you criticize Gallup's measure, it earned its bones in 2011 at the time of the Debt Ceiling Debacle, when it was the only measure that accurately reported that consumers hadn't stopped spending. So if retailers are reporting poor sales, but consumers are telling people that they are spending 10% this year vs. last year, then we have to wonder if the official measures aren't catching the full extent of the big secular increase in online sales. Yesterday, the conservative blogsphere was on fire with a new report from the Harvard Business School that supposedly proved raising the minimum wage is forever damaging to the local restaurant industry. Rather than reading the actual report themselves, both Mr. Shaw and Mr. Hinderaker relied on the Washington Examiner as their media filter. This was a big mistake. In the words of the Princess Bride, "I don't think that report says what you think it says.. There is an entire body of work in the progressive sphere dedicated to nothing but this particular propaganda effort. The premise makes no sense in terms of basic economics (or simply math, for that matter) but it keeps on being repeated. And yet, when the experiment is moved off of the chalkboard and out into the real world the opposite always seems to happen. A number of cities across the country have enacted dramatic increases in the minimum wage. This has caused a great deal of harm, but on the plus side, it has enabled research on the economic consequences of mandating wages at higher than market rates. In my next post, I'll look at the results. Because, like the above points, they don't support Mr. Shaw or Mr. Hinderaker nearly as much as either thinks. Jazz Shaw desperately wants to make sure that his readers believe raising the minimum wage is a bad idea that will lead to job losses. Hot off the presses, he cites a new Harvard Business Review article that he things validates his position. Not only did San Francisco come in as number one with the most restaurants per capita, no other city even came close. At 39.3 restaurants per 10,000 households, San Francisco has nearly 50 percent more relative restaurants than the second place city. San Francisco's restaurant scene is outpacing New York — at least in terms of growth. That's according to a new study by conducted by international payment processing company First Data, which compares New York and San Francisco's restaurant scenes and delivers some intriguing insights about dining trends in both cities. Here's econ 101 for Mr. Shaw: San Franciso's large number of restaurants created a labor shortage. That means there were too few workers. It's called supply and demand. Combine that with sky high real estate prices and it's no wonder we have this problem. Mr. Shaw is making a classic rookie mistake: correlation does not equal causation. So, once again, we have an analytical failure by Mr. Shaw. Does he care? Not at all. Retractions and corrections are for the liberal press, not conservative bloggers. This morning's reports on housing permits and industrial production were good news or bad news, depending on the context in which you place them.